On March 19 Metro Istanbul started test runs on the fully automated metro Line M7. The 24.5km line will link Kabataş to Mahmutbey, serving 19 stations. Construction began in 2014. M7 will use four-car Hyundai Rotem trains and Bombardier Cityflo 650 signalling. 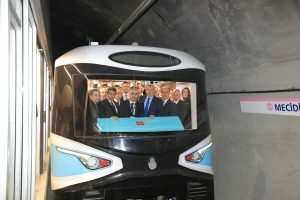 This new line will be the second fully automated line in Istanbul after M5, which opened in 2017, and the first on the European side on the city. Work on the projet’s second phase, from Mahmutbey to Esenyurt, is underway since 2017. On 2 March Transports Metropolitans de Barcelona inaugurated a new intermediate station on the the automated Line 10 Sud, located in the neighborhood of Santa Eulàlia de l’Hospitalet. 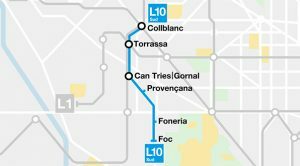 Line L10 Sud runs from Foc (Barcelona) to Collblanc (Hospitalet), covering a journey of 4.5km and now has six stations. This new station, located between Can Tries/Gornal and Foneria, has been built in a well format, with a lower and upper track, like the other stations on the same line.